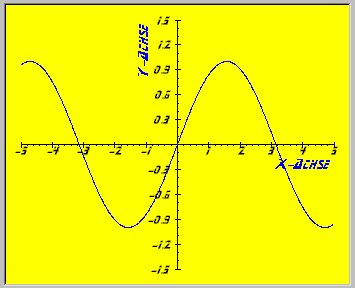 Via this 2D-Graphic-Control equations (for example: sin(x) ) or truth tables can quite simply drawn. In one coordinate system any number of equations and truth tables – also mixed – are possible. This version is FREEWARE. You can use it on your own risk. Draw a box around the output. This property depends also from BorderStyle! Change the background color. COLORREF is a RGB value. Set the look of the bounding box. It depends also from Appearance. The divider of the grid will be set by XDelta and YDelta property. Also the divider may be calculated by the control if XautoDelta and/or YAutoDelta are set to TRUE. 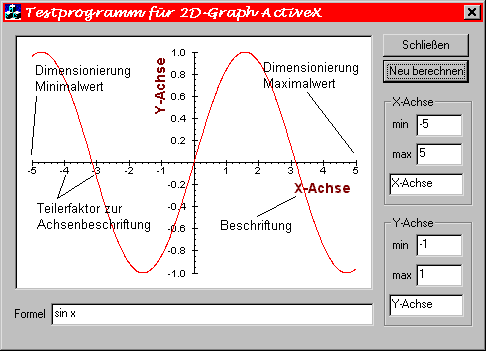 Caption of x axis. This is an optional setting. Caption of the y axis. This is an optional setting. 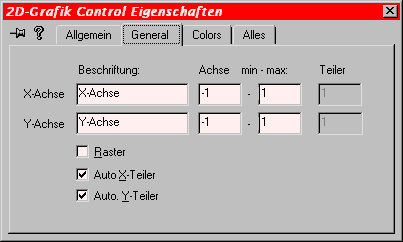 If TRUE, the x divider will be automatically calculated by the control. If TRUE, the y divider will be automatically calculated by the control. Color of the coordinate system. COLORREF is a RGB value. Divider of the x axis for the grid. The divider will be always labeled! Any mathematical function will be accepted e.g. "1/x*sin(x)" is valid property. Only one function can be set as a property all other functions must be set by the methods of this control. The control set the id number of this function to 0. A mathematical function will be calculated and immediately drawn. ID (1...), which was used in "AddFunction"
The function with the selected ID number will be deleted. A new truth table will be created. The x-y values can be set after. any ID (1...), which was set in "AddTable()"
Delete the truth table with the selected ID number. The control don't sort the values. All values are shown in the order they are added into the truth table. A new truth table will be created and all x/y pairs will be read from the text file (every line there must be one x-row and one y-row). You should set a separator character before with the property "Separator".